The killing of Osama bin Laden accounted for 80% of the news links on blogs last week, making it the biggest single-week news topic discussed in the blogosphere since the Pew Research Center’s Project for Excellence in Journalism began tracking blogs in January 2009. 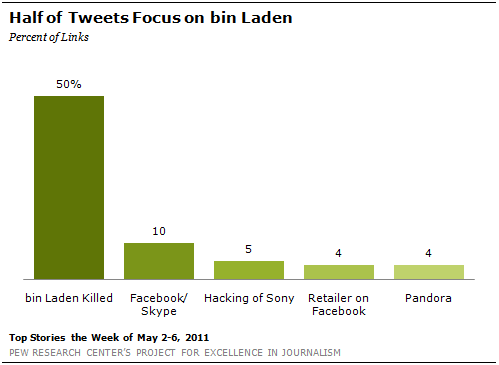 The bin Laden conversation also accounted for fully half (50%) of the news links on Twitter from May 2-May 6. That would register it as one of the top 10 Twitter stories in the past two years. After a full week, social media continued to discuss bin Laden’s death in much the way PEJ found they had after the first three days. In a special report on May 5, PEJ reported that on blogs, the leading topic was a narrative account of the dramatic May 1 raid in Pakistan while humor and jokes constituted the largest response on Facebook and Twitter. For the rest of the week, those basic outlines remained, although attention to both those themes diminished. 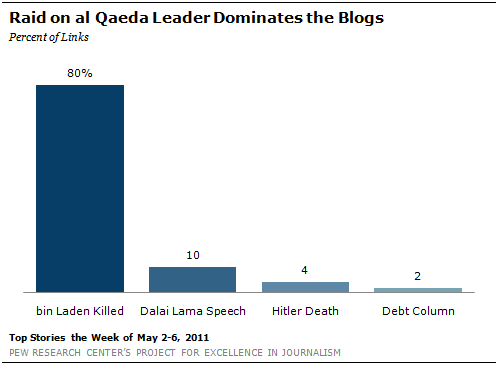 And while bloggers and Twitter and Facebook users were busy sharing and disseminating new developments in the basic narrative throughout the week, there was also substantial skepticism in the online platforms about whether the al Qaeda leader had actually been killed in the May 1 raid. In the blogosphere, attention was divided as eight different themes accounted for between 7% and 13% of the conversation. That included the question of whether President Bush or Obama deserved credit for the bin Laden mission, but also straight narrative accounts, the impact on the U.S. relationship with Pakistan and the effect on the U.S. economy. And about one-quarter of the bloggers’ conversation involved either fears of terrorist retaliation or conspiracy theories. On Twitter and Facebook, where posts are shorter and are often made up of instantaneous reactions, discussion of conspiracy theories and hoaxes emerged as the No. 2 theme, right behind the humor thread. As the week progressed, the percentage of posts made up of jokes fell significantly while the segment devoted to straight accounts of the May 1 raid increased, ultimately finishing the week as the third-biggest topic. And as is often the case, Twitter users also became more focused on the role social media was playing. In addition to PEJ’s regular method of tracking social media that makes up the weekly NMI, this report includes data derived using computer technology by Crimson Hexagon that examined more 160,000 blog posts, and 7.8 million posts on Twitter or Facebook from May 1 through May 8. (Note: Facebook posts are not typically included in PEJ’s social media analysis.) While PEJ’s NMI tracks links from social media posts to news articles as one way to follow online interest, Crimson Hexagon’s software is able to divide a much wider range of posts into themes, regardless of whether the piece of media has a link or not. During the nighttime hours of May 1, when news of bin Laden’s death was just breaking, many people went to Twitter and Facebook to pass on the news or share their initial reactions. Indeed, media reports have generally credited Keith Urbahn—chief of staff to former defense secretary Donald Rumsfeld—who tweeted word of bin Laden’s death at about 9:45 ET as being the first person to break the news. Others linked to video of President Obama’s announcement on the matter. But the initial instinct for many others was to pass along jokes. In the day and a half following news of the death, more than 20% of the conversation on Twitter and Facebook was humorous in nature. While the discussion devoted to jokes declined over the week (down to 11% for the last four days of the week of May 5 to May 8), for the week overall, humor was the single largest narrative at 18%. “Dear #Osama Bin Laden, Welcome Home, Sincerely The Devil,” tweeted Paul Debono. A particularly popular joke showed checkmarks next to the names of three deceased global villains—Adolf Hitler, Saddam Hussein and bin Laden—and then included the name of a very successful living pop star who apparently invokes some people’s ire. 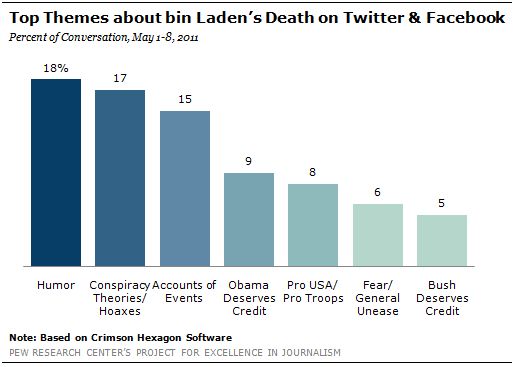 Discussions of conspiracy theories and the possibility that bin Laden was not actually killed also appeared frequently as 17% of the conversation throughout the week fell into that category. “Of course we all believe you buried bin Laden in the sea, no really we do, honestly!” added JustRhea sarcastically. As the week progressed, the area of discussion that grew the most was news about further developments in the story. On the day after the raid, on May 2, 13% of the conversation on Facebook and Twitter fell into that category. By the end of the week, that number almost doubled to 25% on May 8. People were using social media to keep others up-to-date on new information as it emerged. And as is often the case with users of social media and especially Twitter, a number of users reflected on the role of social media itself. Many linked to a Mashable poll of its readers that showed that more than half of them learned about Bin Laden’s death on Twitter or Facebook. Others were intrigued by the story of Sohaib Athar, a.k.a. @ReallyVirtual, who lives in Abbottabad and reported the events of the raid without knowing it. Athar described the sounds of helicopters in his neighborhood on May 1 without knowing what was actually happening. “Uh oh, now I’m the guy who liveblogged the Osama raid without knowing it,” Athar later wrote. Finally, politics were present in some of the Facebook and Twitter discussion as 14% of the conversation fell into that category and specifically involved the question of which president deserved more credit for bin Laden’s demise. However, unlike many other major events, politics did not overwhelm all other concerns. For those who did discuss the political fallout, Obama received almost twice as much credit as former President Bush did (9% to 5%). “Osama Bin Laden KILLED!!!! whaaaaat! Obama is will automatically be re-elected,” predicted Enitan Bereola, II. “THANKS GEORGE W,” wrote Dan Scattolini while linking to a column on Townhall.com that argued that Bush policies helped take down Bin Laden. The issue of presidential kudos also accounted for 14% of the conversation on blogs last week, but politics was not the dominant subject that is often the case with major news stories. However, unlike on Twitter and Facebook, bloggers were evenly split between giving Obama and Bush credit. “With the death of Osama Bin Laden, Congratulations are in order to…President [Obama]. Good job. Job well done,” applauded Parker Renfrow. But aside from expressions of pride or relief, there were narratives reflecting uneasiness that emerged in the blogosphere. Almost a quarter of the conversation revolved around fears of repercussions as a result of the raid (13%) and talk of conspiracy and hoaxes (11%). 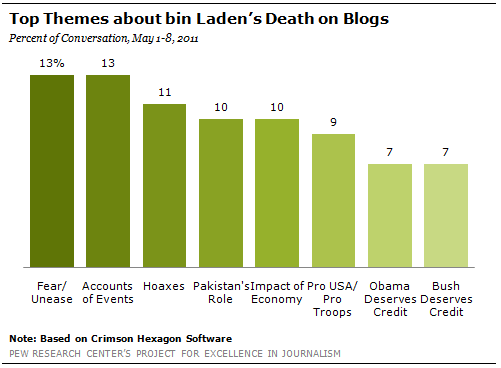 Compared with Twitter, bloggers who did not believe the official story about the death of bin Laden had more space to describe their own alternate theories. Many bloggers pointed to a 2001 Foxnews.com report that quoted the Pakistan Observer as saying that bin Laden died that year due to lung problems. Others were troubled by the changing details of the raid put out by the Obama administration. Some expressed concerns about the fallout from bin Laden’s death. A lot of other bloggers simply reprinted parts of news articles warning against potential attacks, such as a story from the Australian 9 News site that quoted the alleged mastermind of the 9/11 attacks, Khalid Sheikh Mohammed. According to the report, leaked files found on WikiLeaks quote Mohammed as saying that al Qaeda has hidden a nuclear bomb in Europe which will they will unleash if Osama bin Laden is captured. Two other themes present in the blogosphere were the role of Pakistan and the impact of the news on the U.S. economy. The No. 2 story on blogs last week, with 10% of the news links, was related to the main storyline. The Dalai Lama gave a May 3 speech at USC where he appeared to suggest that bin Laden’s death was justified. That was followed by another related article; one recalling that on May 1, 1945, Germany announced Hitler had been killed (at 4%). The fourth-biggest story was a Washington Post opinion piece by Joel Achenbach discussing the national debt (at 2%). On Twitter, the second-largest story (at 10%) was a report that Facebook was considering an offer to buy Skype (Instead, Microsoft bought the popular internet calling service a week later for a reported $8.5 billion.) Stories about the hacking of the Sony company in response to its handling of the breach of the Playstation network were third, at 5%. News that the fashion retailer Express is now selling its entire catalogue on Facebook was fourth (at 4%), while the expansion of the internet radio service Pandora to include thousands of comedy clips was fifth, also at 4%. While the death of bin Laden dominated areas of social media where people passed along news and expressed their opinions, it did not register nearly as highly on the video sharing site YouTube. One possible explanation may be the lack of dramatic images released in the wake of the highly secretive raid. Instead, the focus was on the deadly tornadoes that ripped through the Southeast over the previous two weeks. Two of the top five most-viewed news videos illustrated the resulting devastation. The most-viewed news video showed a tornado striking Lambert-St. Louis International Airport, Missouri’s largest airport, on April 22. The twister tore through a terminal and parts of concourse C forcing people to run for shelter and leaving a trail of debris. The No. 5 video, shot from inside a car on April 27, showed the driver closely following tornadoes as they swept through the north side of Philadelphia, Mississippi. Viewers can witness the devastation, toppled trees and power lines and homes covered by fallen trees. 2. A man named Matt Cranch dies after a safety net failed during a human cannonball stunt at a Kent County showground in the U.K.